September is National Food Safety Education Month! Whether you are cooking for yourself or in a food service establishment cooking for others you should always aim to practice food safety. Food safety is important for a variety of reasons. Good food safety practices prevent bacteria overgrowth in food, which can cause foodborne illnesses. They can also prevent cross-contamination when dealing with allergies. Clients of Food & Friends have serious conditions (HIV/AIDS, cancer, renal disease, etc.) that compromise their immune systems, making them particularly susceptible to foodborne illnesses. Therefore, it is especially important to practice the highest food safety standards when working with this community as a chef, volunteer or caregiver. Learn more about how you can be food safe below! 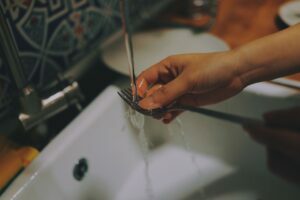 Wash your hands with plain soap and running water to prevent the spread of bacteria to any food you will be handling. Be sure to wash utensils and any surfaces (cutting boards, utensils, countertops etc.) that you used while cooking to prevent the spread of bacteria through your kitchen. Lastly, make sure you wash fruits and veggies before eating, or cooking. If they are not washed, bacteria may spread from the outside to the inside of the food when it is cut or peeled. Prevent cross-contamination. Cross-contamination can occur in many ways: sharing cutting boards between frozen meats and fruits/vegetables or not separating produce and meats in the fridge. To help prevent cross-contamination, dedicate one cutting board to raw meats and a separate cutting board for fruits and veggies. Keep meat, poultry and eggs separated in your grocery cart as well as your fridge. Bacteria can spread from juices if these foods are too close to one another. Make sure to cook your food to the appropriate temperature. The two most important temperatures to always keep in mind are 40˚ and 140˚ Fahrenheit. This range between 40˚ and 140˚ Fahrenheit is known as the temperature danger zone. This range is where bacteria can grow and multiply the quickest which puts consumers at risk for food poisoning. To prevent food from entering the temperature danger zone, use a food thermometer. Cooked foods are only safe when they have been cooked to a high enough temperature that kills all dangerous bacteria. Make sure to keep food hot after cooking (140˚ F or above). Similar to cooking, be sure to microwave your food thoroughly (165˚ or higher) as well to make sure all bacteria are killed. Refrigerating your foods promptly is an essential part of food safety. Illness-causing bacteria can grow in perishable foods within two hours if they are not refrigerated (one hour for summer months). Make sure your fridge is between 40 ˚F and 32 ˚F and freezer at 0 ˚F or below. Appliance thermometers can be used to take the temperature of your fridge and freezer. Freezing foods does not kill harmful bacteria but it does keep food safe until it is eaten. An important reminder that many do not realize is that food should never be thawed or marinated on the counter. 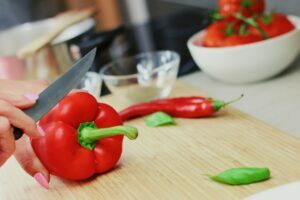 Since bacteria can grow quickly at room temperature, thawing or marinating on the counter is one of the riskiest things you can do while preparing food. Other ways to thaw food include: in the fridge, in cold water, in the microwave, or cook without thawing.